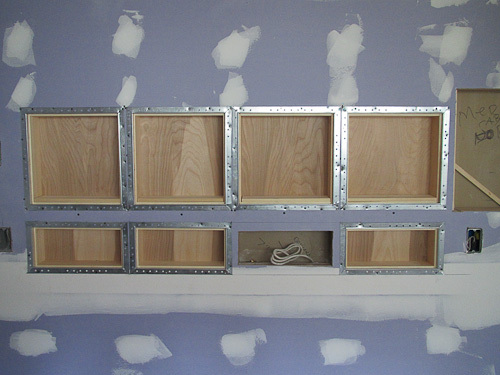 Start by deciding where you want the shelving and frame it out between the studs. I wanted those bottom cubbies to sit just above my tall countertop (my countertop sits 38″ high) so we planned accordingly. The box on the right is for the vintage medicine cabinet, which I added for decorative effect. And I also installed my vintage Sunbeam Appliance Center in the smaller bottom box second from the right. You will also see we planned for two additional countertop-height electrical outlets and another one near the floor. And on the far left, top, that’s the thermostat for the added electric baseboard heater we put under the window. 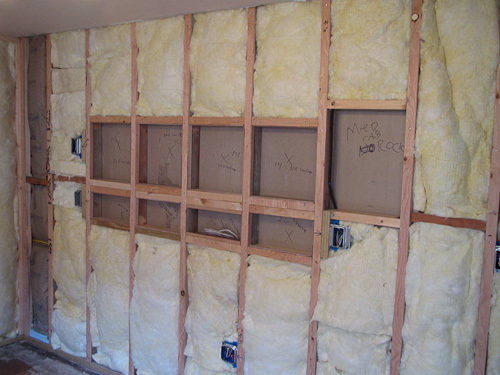 We also replaced all the insulation in all the walls. Then my contractor Kevin put up the drywall — right over everything. 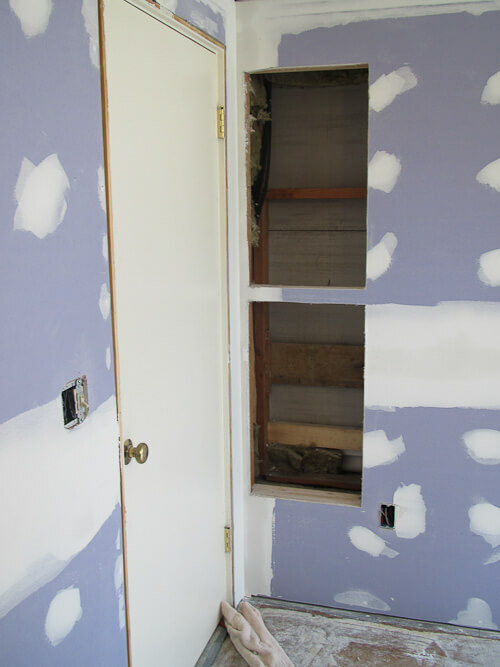 Then he cut the drywall to reveal the openings. He then installed the boxes right into the openings. He used finish-grade plywood, in case I decided to stain the shelves vs. paint them. 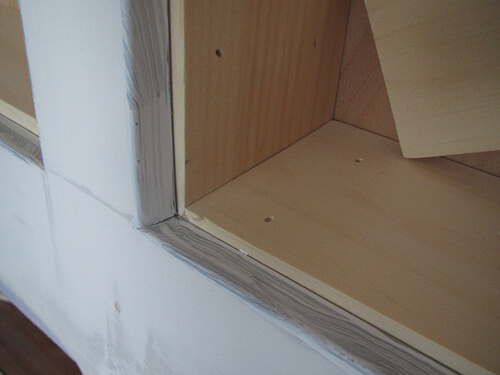 He then installed the drywall L-bead — this is also called corner bead — edging…I *think* that is what it is called… i *think* it is pretty commonly available…. Then, everything got drywall seam finish or whatever. Above: You can see my first coat of primer on the metal bead — which is magnetic, I have discovered! Super cool benefit I wasn’t even anticipating! 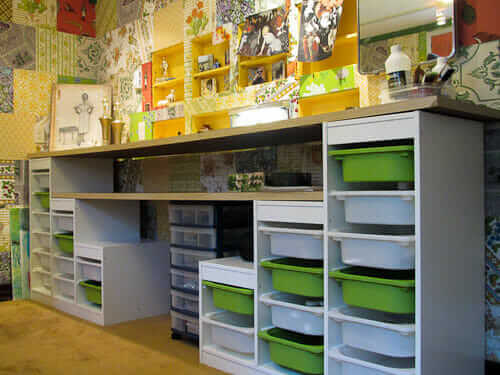 Above: I want you to see how beaded edge gave me a nice smooth look around a shelving area that already was “busy” because the shelving was small. 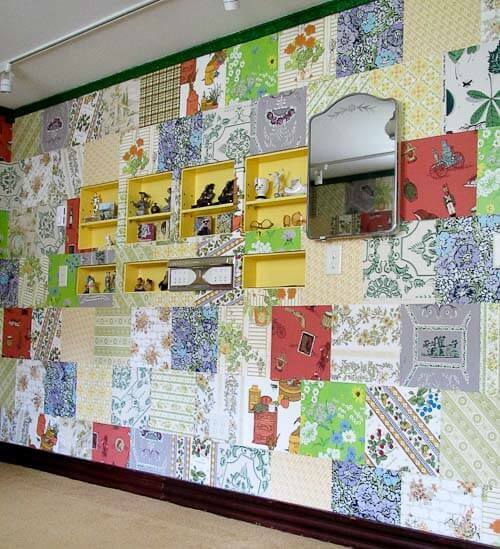 In addition, it gave me the opportunity to keep the focus on my crazy quilt wallpaper installation. 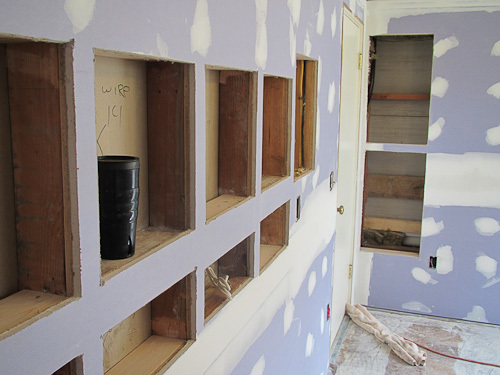 The whole recessed shelving thing was a pain in the neck to install, though, I’m thinking it added a small bundle to my contractor bill because it was “fussy”. 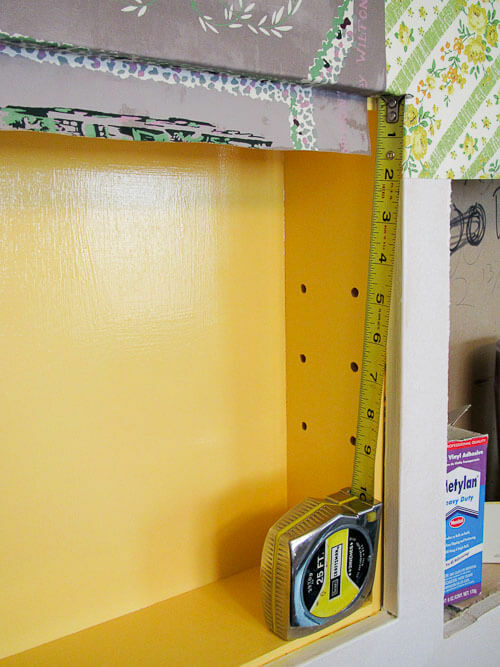 Step: I painted the shelves — two coats — BEFORE I primed the metal trim and BEFORE I wallpapered. 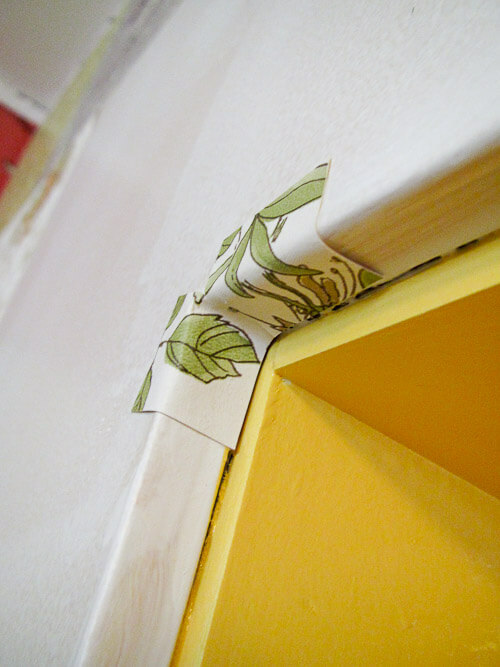 I let the paint dry a good long time — because I knew that later, I would have to trim wallpaper from it, and I didn’t want any unwanted adhesion going on. 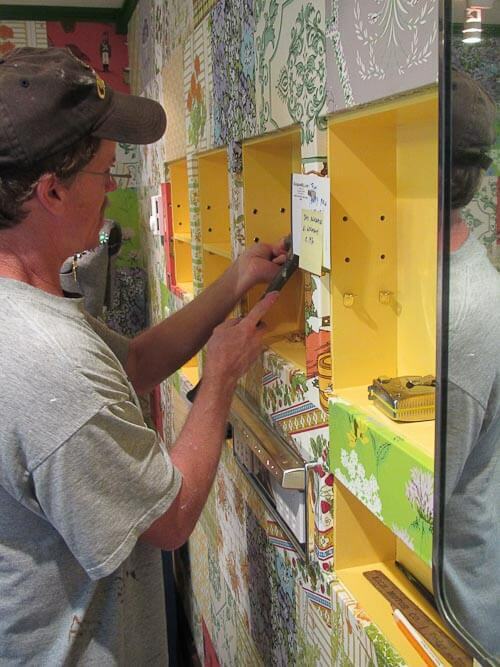 This drying process was particularly important because it was very humid while we were working on the wallpaper. It took a long time for that high-gloss paint to harden. Above: On this wall — which backs up the downstairs bathroom, we had lots more depth. Like 11″. So I specified two deep, tallish recessed shelves that on the left, the shelf sits behind the door when it’s open to the basement family room, which is most of the time. 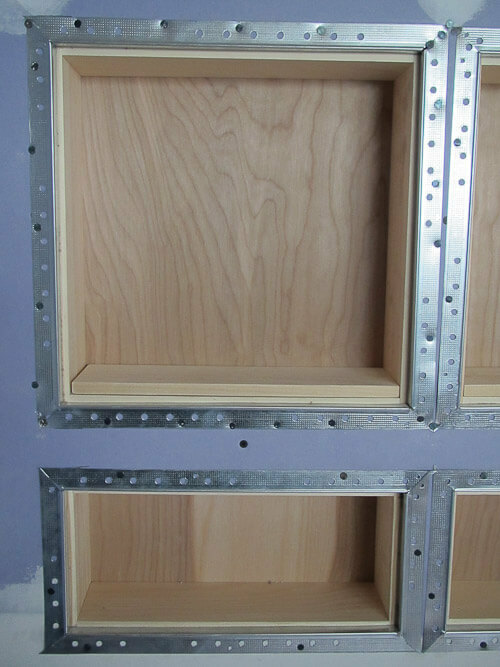 To create and finish the deep shelf: Same process, but in this case, the wall was uneven to the opening, so we did not use the L-bead/corner bead. We used regular wood trim to finish the boxes. I wallpapered the trim. 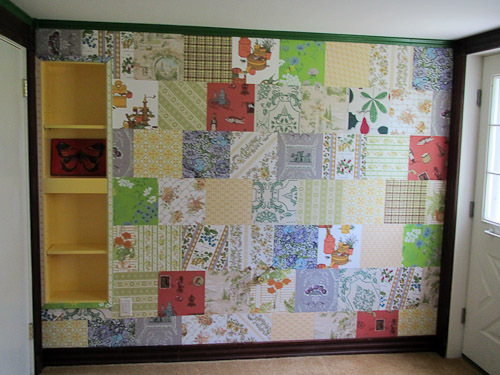 The wallpaper is duct-taped on, then I nailed in the pieces with finishing nails. 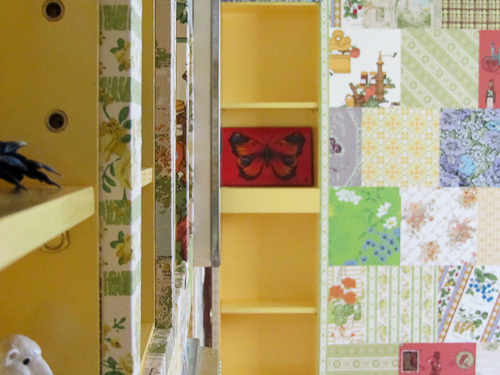 Wallpapering the edges of the smooth-edged shelving was also fussy. I first put a bit of wallpaper like this. Then I mitered in the actual bigger piece over. This is messier than it looks in real life — I would go back with a razor or exacto after everything was dry and clean up that edge. That said, it ain’t perfect, because I get too impatient. Not to worry. 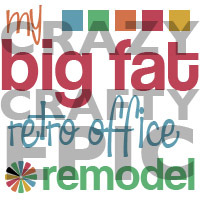 The Retro Decorating Gods get angered when you get attached to the idea that everything should be perfect; only they are perfect. I used all kinds of tricks to get the wallpaper to stick onto the metal. 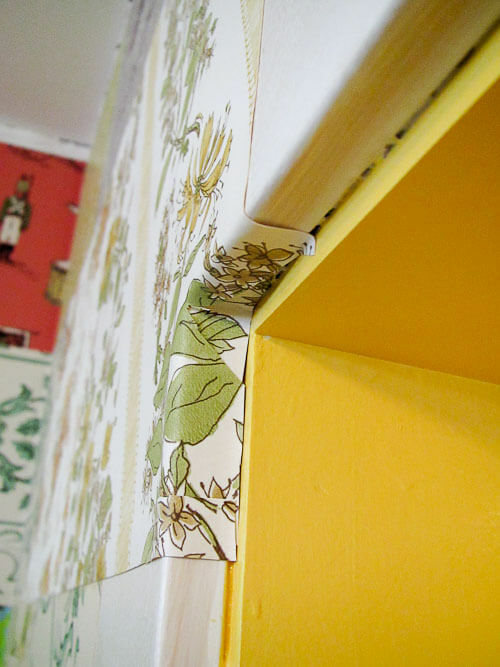 Even though I had primed the metal twice, getting the wallpaper to stick was sometimes tricky — it very much depended on the paper. The key was to get the paper to dry in place without lifting. I also used super magnets to hold the paper down — I love magnets!!! Also, see how the lavendar wallpaper looks discolored while soaked with wallpaper paste? It dried fine. But you might want to test first. 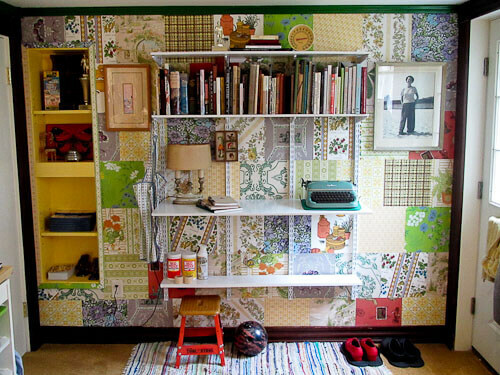 See my big story on how to wallpaper a wall with vintage wallpaper for lots of tips. Kevin knew how to do shelf pegs with grommets. I chose brass grommets. A great little finishing touch. Groovy baby. Kevin was way into my project by this point. He is THE BEST CONTRACTOR EVER. Bottom line lesson: If your walls are open, use the opportunity to add recessed shelving, if it suits the needs of the space. 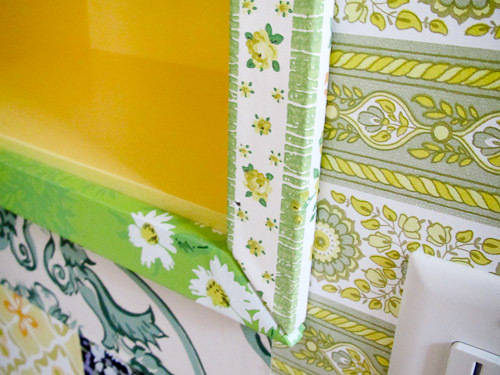 In a bathroom wall — there may be many more inches of depth to work with — which may be a read godsend if the bathroom is small (like in many of our midcentury houses) and you want/need more storage space. Note, I also did a recessed 8″ cabinet in my small master bathroom. It’s really great to have the depth. I made doors for it with vintage shutters. 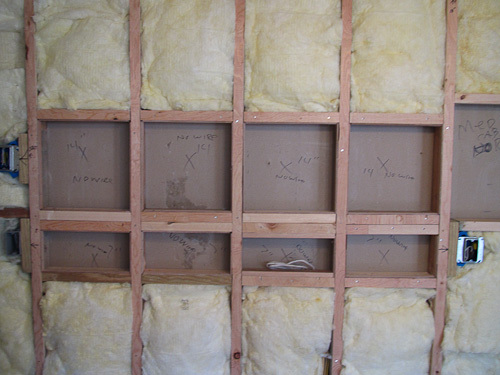 Final tip: I doubt that I would ever do this on outside wall — you need the full benefit of insulation and sealing there. Consult with a properly licensed professional before considering this option. Even my adding this vintage medicine cabinet — which I found at an estate sale like 10 years ago (!) and had hoarded in the attic all that time — was a move to add more storage space. Make sure when you install these, that the door swings the correct way; I think it’s bad feng shui when details like that are wrong. 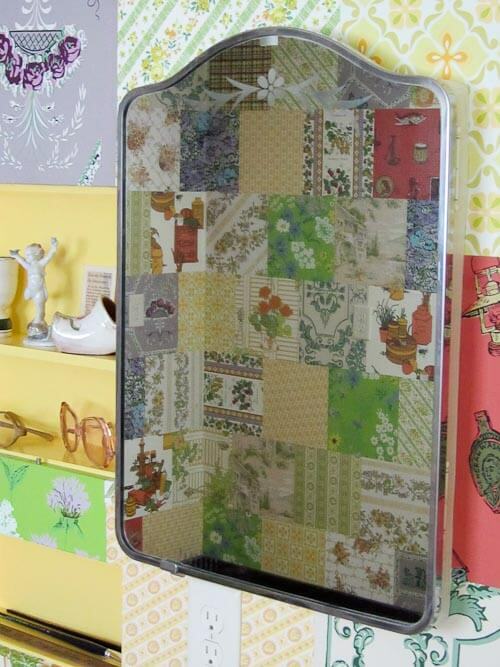 In addition, I love how the medicine cabinet adds a non-square decorative flourish to my crazy quilt office. How cool is that! Congrats on making the perfect space for it! I have been thinking about doing this forever as my dining room is not big enough for a side buffet. The wall is between the dining room and an office so it doesn’t need insulation. Wish I had done it when the room was drywalled, but I think we can cut holes in it now. Thanks for this post Pam!